Both methods use UnityObject.FindComponentOfType method and super slow. Hashtable is a dictionary without generic parameters. Following types are supported as keys: int, string, bool, Guid, custom fields. Following types are not supported as values: Unity assets, relations, hashtable, nullable structs. Null values are also not supported. Asset should be included in the asset bundle. This is super complicated way. To be properly resolved, asset bundle, the asset belongs to, should be properly loaded at the moment we try to query this field, otherwise null will be returned. Note, we do not manage asset bundles in any way. Also, asset bundles should be built before assets from this bundle can be properly resolved when working with BGDatabase in Editor. Use newly introduced Unity's Addressables package (which is not ready yet, still in preview). We have added experimental support for this package (built and tested against 0.3.5-preview version). 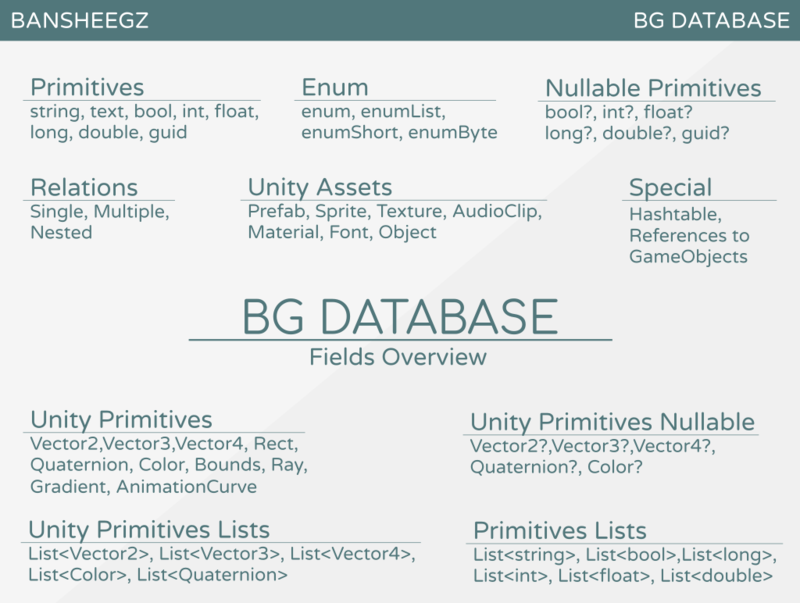 Just like with asset bundles, you need to preload assets to be able to properly resolve them, but unlike asset bundles, you do not have to build addressables to resolve them while working with BGDatabase in Editor.